From close up to far away, this mid-size SkyHawk 4.0 10x42 delivers bright, crisp images with a bright 42mm aperture. 10x power for great long-range detail, perfect for wide-open country and hilly regions. Free ship within European Union for all products with Green Seal! For other destinations, add your product to cart to estimate shipping costs. Anyone who keeps a close eye on nature experiences a unique fascination. 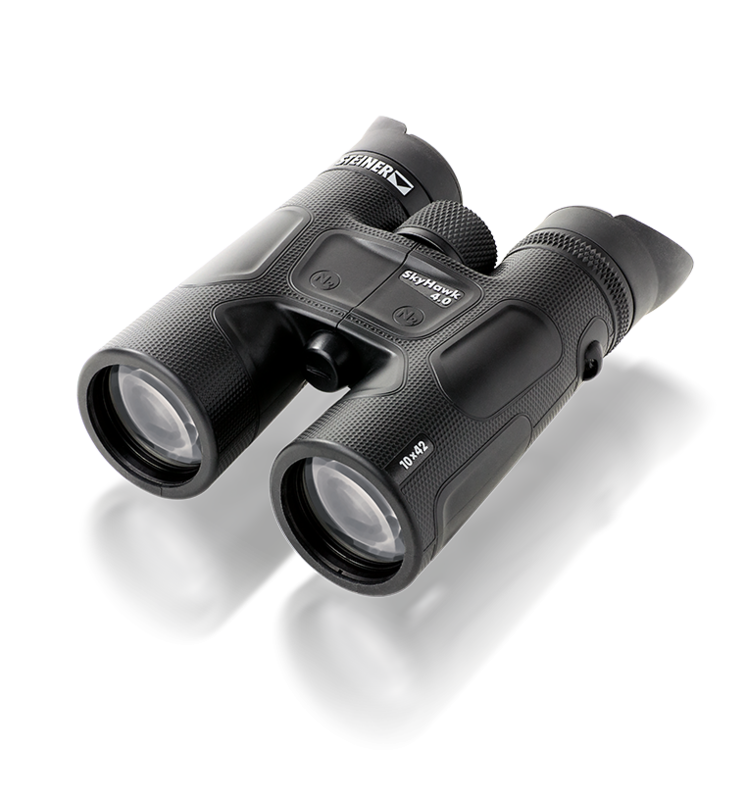 This is exactly what we have developed the SkyHawk 4.0 for: to observe nature clear and sharp at any times. The outstanding High-Contrast-Optics deliver razor-sharp images and depict every facet of nature in detail. Whether in the garden, in the woods or in the open fields, whether in the snow or by the sea, noon or at dusk – thanks to the Distance-Control-System of the SkyHawk 4.0 it is only one small hand movement from a brilliant observation of a bird flying high up in the clouds to the contour sharp close-up of a beetle in the grass in front of you. 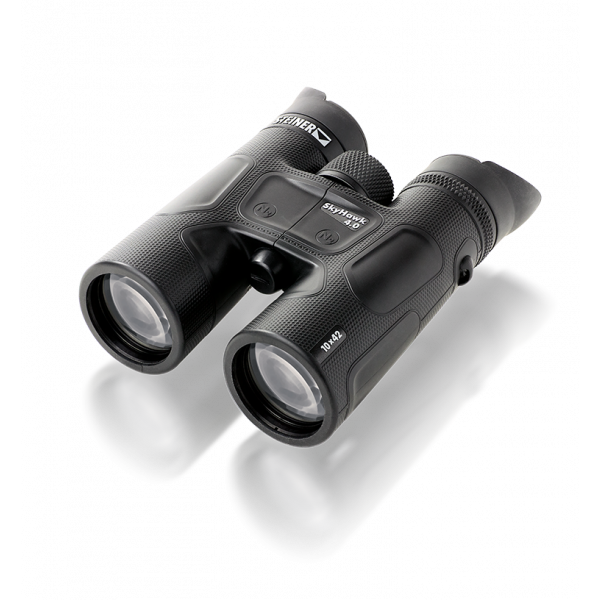 We have optimized all the minor and major details and are setting a new standard with an unseen new design: No other binocular can compare in terms of look, ergonomics and handling. This makes even long-term observations a comfortable experience and the new SkyHawk strap attachment offers a universal mounting option for every application. The extensive range of accessories rounds off the SkyHawk package and, in addition to a high-quality bag, rain cover and the lens caps, a soft padded neoprene carrying strap provides fatigue-free wearing, even during long hikes. 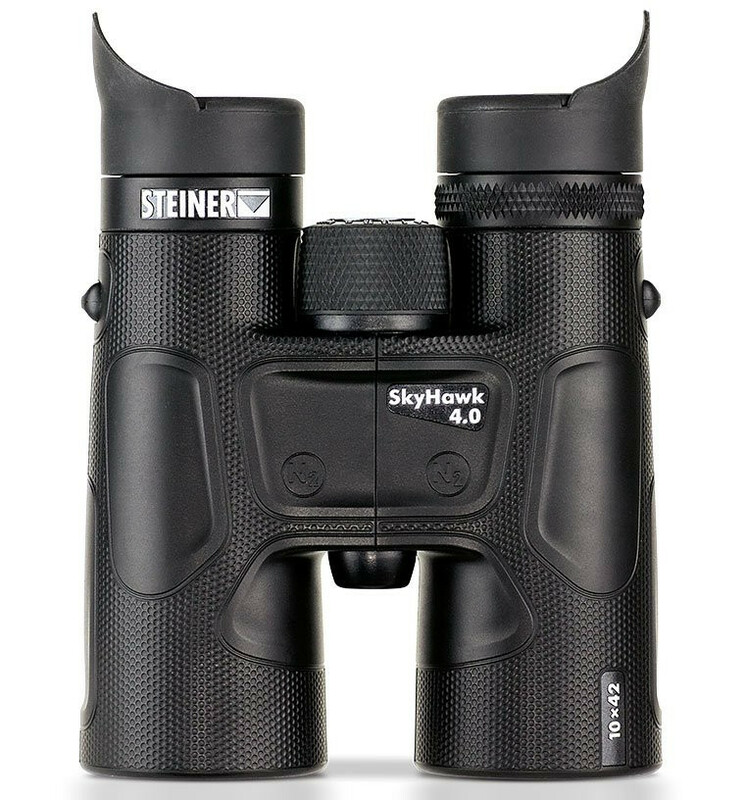 The new SkyHawk series offers a unique optic experience and impresses of course with the already legendary STEINER ruggedness. provide bright views, accurate colour and clear, brilliant 3D-images with high contour sharpness for exceptional performance around outdoor activities up to close range of 2 m.
Fast-Close-Focus central focusing wheel requires minimal, stepless rotation for quick absolute sharpness from close-up to infinity- comfortable, easy to use. enables pre-setting of observation distance and sharp focusing by one simple turn of the non-slip XL-focusing wheel. with durable polycarbonate Makrolon housing, Water Pressure Proofness to 3 m and the Nitrogen-Pressure-Filling into the optic against fogging up inside at temperature range between -20°C to +70°C. Non-slip NBR-Longlife rubber armour protection resists oil, acid or adverse weather. Impervious to harsh conditions for generations of trusted use. providing comfortable long-term observations. Ergonomic pliable eyecups made of soft, skin-friendly and non-ageing silicone protect against incident light and draught. Simply to be folded down for use with eyeglasses. Finger depressions for an excellent grip. roof prism design has less bulk to fit into your pack and stay out of the way while observing. with case, neoprene-carrying strap, rain protection cap and objective covers.